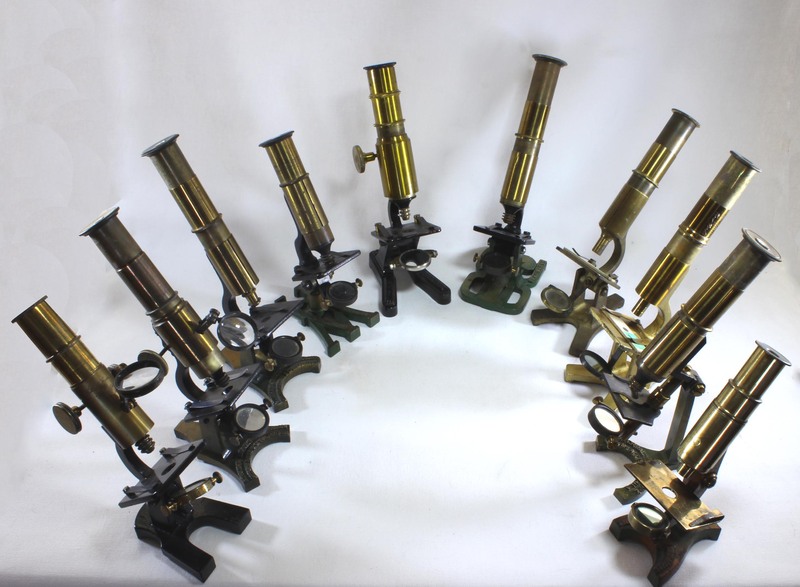 The image above depicts the variety of 'Universal' or 'Household' microscopes in this collection. Although it includes two examples by McAllister, it includes many others. 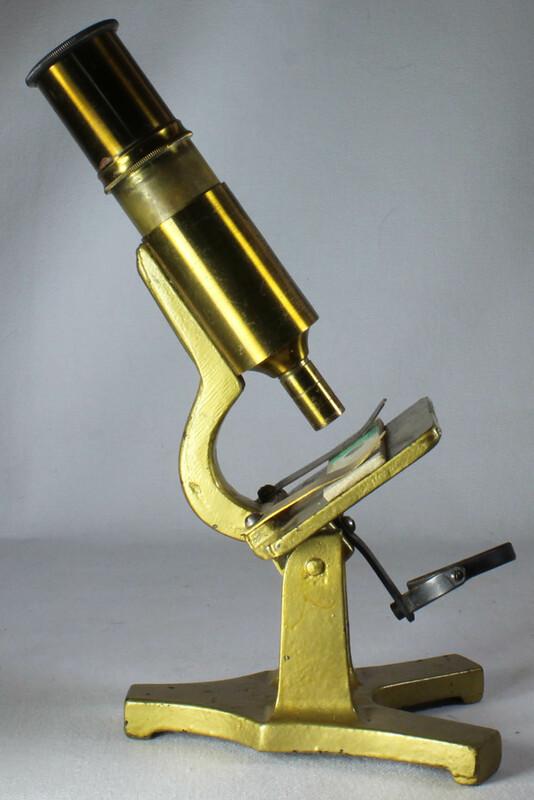 The fact that this idea was copied so widely reflects the popularity of this type of microscope. The idea of a 'Household' or 'Universal Household' or 'Universal' microscope was first conceived of about 1867 by Thomas H. McAllister, who was by then working in New York City. He came from a family in Philadelphia famous as Opticians, specializing especially in spectacles. His 'Household' microscope became very popular. 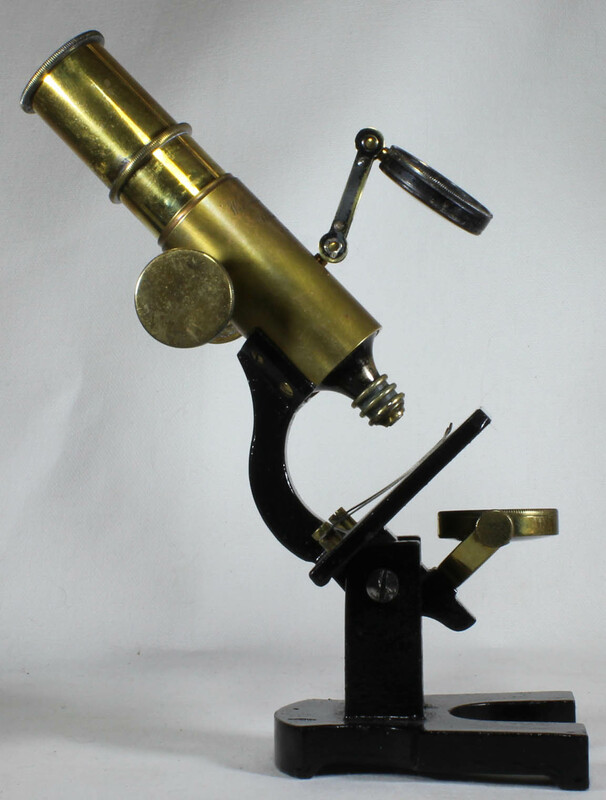 In 1876 at $5 it was one of the least expensive compound microscopes available in America. His design was elegant in its simplicity and he reduced cost by making the foot, limb and stage of painted cast iron. The only brass parts were the sleeve holding the optical tube, the tube itself, and the objectives. He promoted it as an alternative to the cheap French imports which were poorly made and were not of Lister limb construction. It appears that his initial efforts were nonachromatic instruments, as he advertised in 1876 that the objectives were made of 'Crown Glass' and he did not mention achromatism. 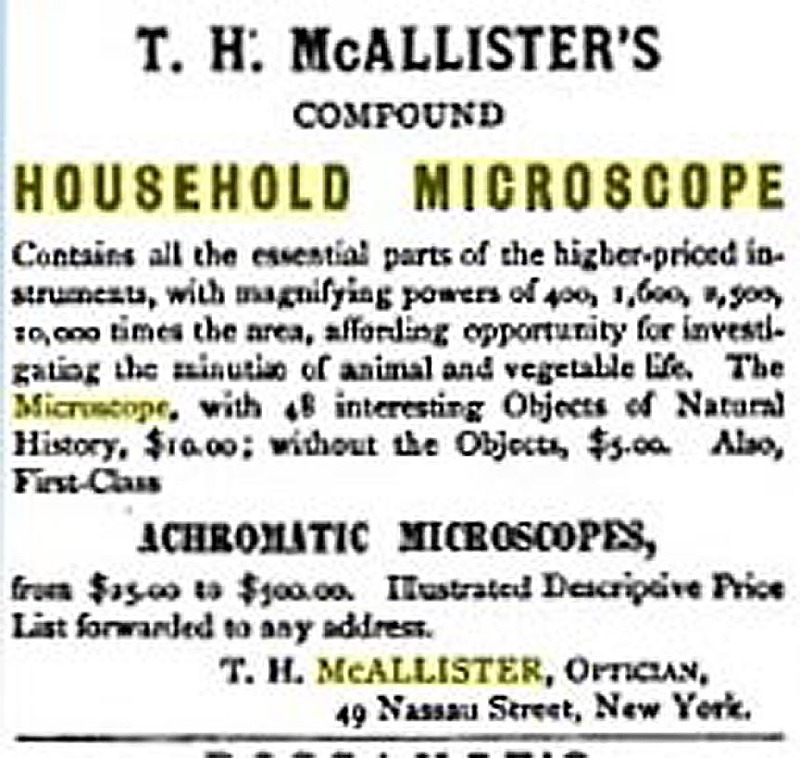 In addition, in the 1869 ad shown here, note that the 'Achromatic Microscopes' are listed separately, clearly indicating his initial Household scope was not achromatic. The 'Household Microscope' was very successful and the idea was later copied by many retailers, most of whom imported their own versions from France. It is said that eventually even T.H. himself could not compete with the French versions, and imported his own as well, though I have never seen a T.H. McAllister microscope of French manufacture. 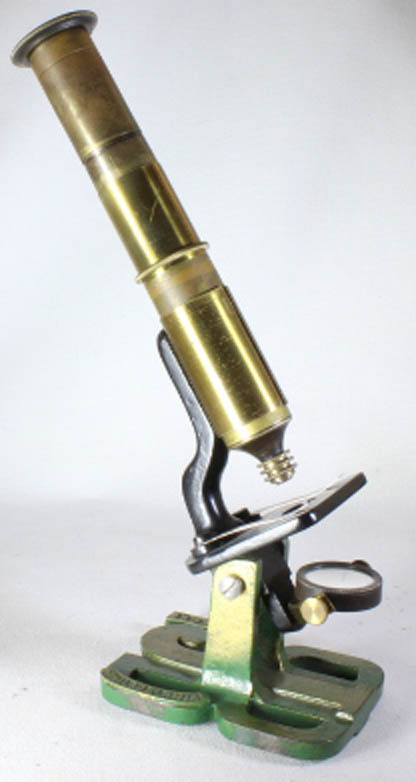 As competition grew, most retailers offered this type of microscope in the original push focus, or with rack and pinion focus; they also offered the option of an achromatic objective which was divisible and doubled the price. The first of these were those made by T. H. McAllister starting about 1867 and continuing for many years. Two are in this collection, and they are quite similar except for the signatures. One has a signature only on the top of the eyepiece, the other is signed in block letters on the sleeve carrying the tube, and also in script on the optical tube itself. Interestingly, only the original T.H. McAllister versions had a swinging tailpiece to allow oblique lighting, all the other versions by other retailers having a fixed tailpiece. Click on the pictures for more information and images. 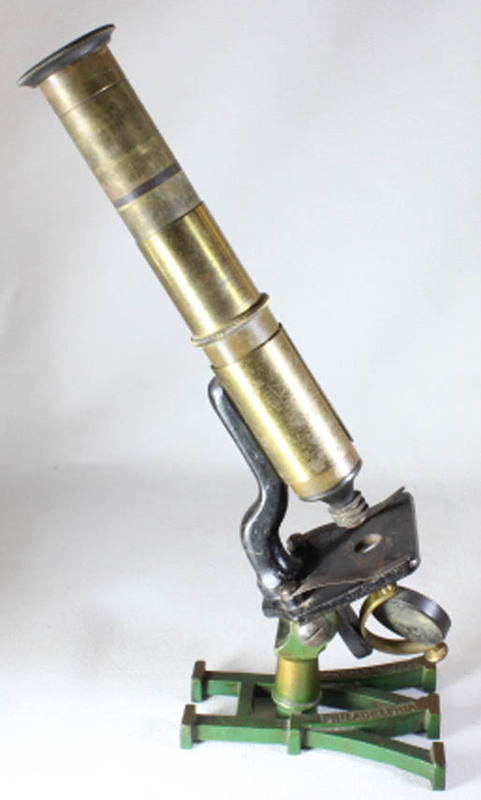 The American Branch of R. & J. Beck sold a 'Universal Household Microscope' starting about 1879, until about 1884-5, when the American Branch was sold to W. H. Walmsley, and became W.H. Walmsley & Co. 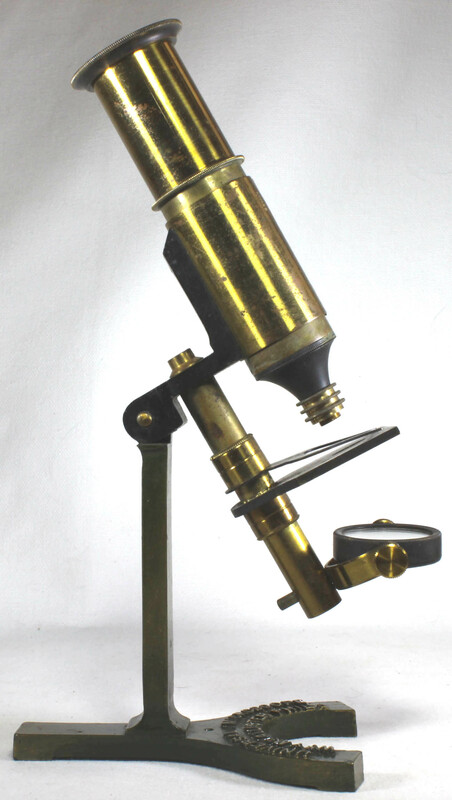 This microscope was also offered as a premium for subscribers as noted in the 1885 issue of Babyland magazine. The only distinctive feature of this microscope is the foot, which is formed of the firm's letters, R, J, and B. The R is reversed on the left side of the RJB, obviously to make the foot symmetrical. It is signed 'R. & J. Beck on the 'R' and 'Philadelphia' on the 'B.' The mirror is on a fixed tailpiece and is of the flat form. The scope is otherwise identical to the Walmsley, Queen and W.Y. McAllister instruments. Just like the Queen model options included rack and pinion focusing and an achromatic objective. The optical tube, including the objective and eyepiece, is identical not only the Walmsley instrument but also the W.Y. McAllister version and the Queen versions. W. H. Walmsley, worked for Queen and eventually became the manager for the American Branch of Beck; eventually his own business succeeded Beck, but he continued initially to carry Beck microscopes. 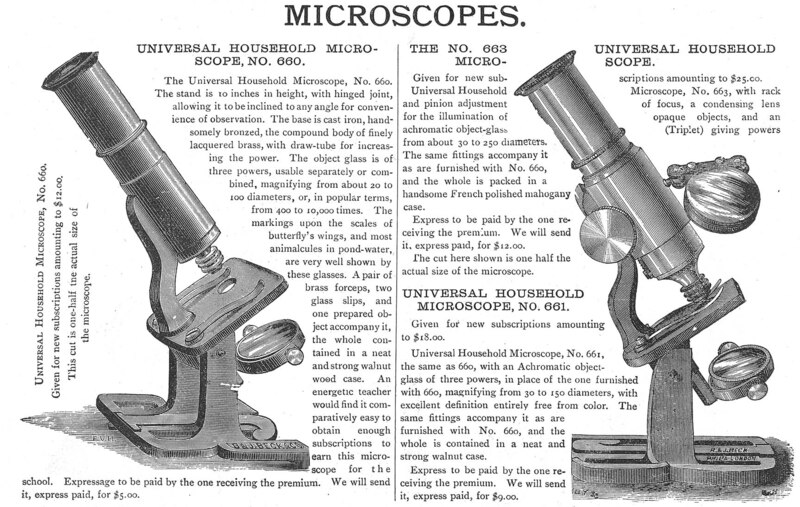 As shown in the entry for Beck above, his 1882 Catalog (as manager of the Philadelphia branch of R. & J. Beck), shows the two versions of the RJB 'Universal Household Microscope.' 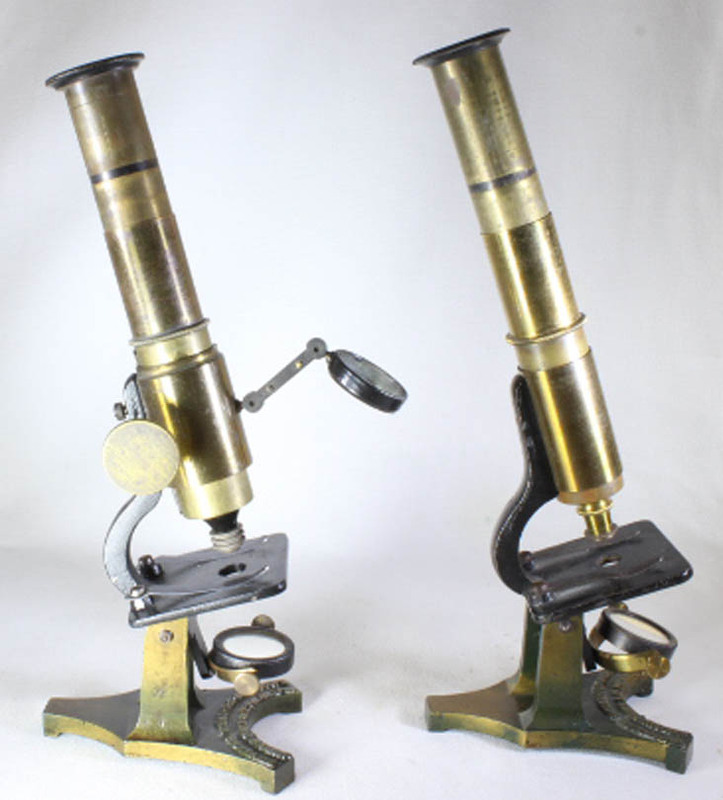 Eventually, Walmsley carried a wider variety of stock and apparently had the same French company make his own version of the same microscope, only with the initials of W. H. with the name of 'W.H.WALMSLEY&Co.' on one limb of the 'W' and 'PHILADELPHIA' on the other limb. The rest of the scope is identical the RJB model. In 1884 the business became W.H. 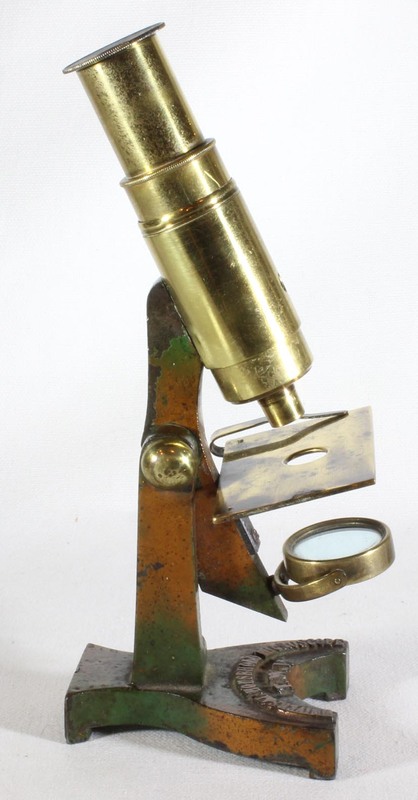 Walmsley & Co, so this microscope must date to after 1883, dating after the R & J. Beck version. It must also date to before 1889 when the firm's name changed to W.H. Walmsley Ltd.
James Queen, a former partner of W.Y. McAllister formed his company about 1853. His version of the 'Universal Household Microscope' was not pictured in the 1883 catalog. It was seen in the 1885 and 1890 catalogs. Like others, it could be ordered in a sliding focus nonachromatic version, or with rack and pinion, and/or with achromatic objective. W.Y. McAllister, T.H. 's older brother, still operating the firm in Philadelphia, although giving credit to T.H., eventually sold his own imported version of the 'Universal' household-type microscope. This was made by the same manufacturer as the 'Household' and 'Universal' microscopes sold by R & J Beck, Walmsley, and Queen. 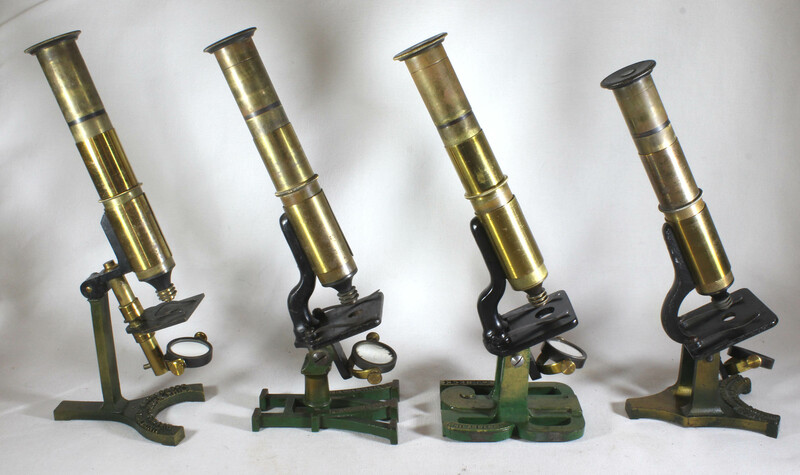 In fact the optical tubes, eyepieces and objectives of the household-type microscopes sold by all four of these retailers are absolutely identical in every detail. It is only the design of the foot, pillar(s), and limb that differs much between them. Signed on the Foot: Universal Household Microscope, F.W.W. It has a push/pull focus, and a flat substage mirror. It has an inclination joint in a Lister-limb pattern. The mirror is supported in a gimbaled support, but is fixed in location. There is no draw tube. It was almost certainly a French Import, made for the American Market. The objective is not divisible. A single remaining stage clip screws to the underside of the stage. When vertical, the bottom of the inclining limb meets the bottom of the pillar in a matching angular cut, thus preventing it from going past vertical when returning from an inclined position. 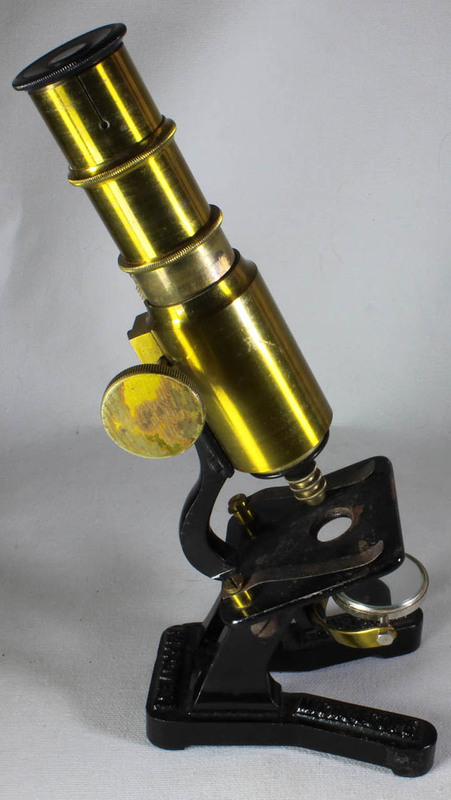 This microscope was likely sold by F.W.Woolworth. H.S. Williams and N.H. Brown also worked for Queen and after leaving him, formed Williams Brown and Earle, a firm that continued well into the 20th century. They marketed a later version of Household-type microscope as seen here. It is of more modern construction in that the eyepiece is removable and chrome plated, though there is no draw tube. This microscope, slightly larger and heavier than the others, features rack and pinion focusing and has a short draw tube. There is a typical 3 button French objective. The mirror which is flat on one side and convex on the other would seem to be the only significant 'improvement' over any of the other models seen here. Note they are identical except for variations in the shape of the foot and the pillar(s) supporting the limb. In one case, that of W.Y. McAllister, the type of limb also differs from the other three which have traditional Lister limbs. All four have identical draw tubes, objectives, eyepieces, and markings on the tubes. They all have single flat gimbaled but otherwise fixed substage mirrors. Also note, that depending on the configuration of the support pillar(s), the overall height differs between them, despite the equal tube lengths. The W.Y. McAllister stand is the tallest, followed by W. H. Walmsley's, Beck's and the smallest belongs to Queen.